Salvatore Ferragamo will launch Uomo Salvatore Ferragamo in July. The new woody oriental fragrance for men will be fronted by actor Ben Barnes. Uomo was developed by perfumers Alberto Morillas and Aurélien Guichard. The notes include black pepper, cardamom, bergamot, tiramisu, orange blossom, ambrox, cashmere wood, sandalwood and tonka bean. 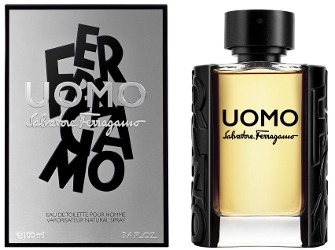 Ferragamo Uomo will be available in 30, 50 and 100 ml Eau de Toilette. Update: Ferragamo Uomo will launch in the US in February 2017. I’ll certainly give this a try, if only because I love the packaging. The bottle is remarkably similar to that of Lalique’s new fragrance for men, L’Insoumis. Ben Barnes? The ads might be ok if he’s smiling If the orange blossom is absent and the tonka bean not too synthetic, it may well smell nice! Orange blossom in fragrance is like sushi/sashimi dishes to me; I want so bad to enjoy them as much as everyone else, but so far in my life, no “nose” or chef has succeeded.